The Studio at Cranfield, an integral part of the Through-Life Engineering Services Centre, is designed to develop knowledge, in-house manufacturing technology demonstrations, novel methodologies and techniques and associated toolsets. Together with the laboratory at Durham these facilities enable the research. Environmental Test Chamber – Supports thermal cycling, dielectric over-voltage, thermal stress and current overload analysis by providing environmental control chamber capable of operating between −70°C to 180°C with variable humidity settings control (10-90%). Robotics – The Studio houses two robotic systems. FANUC robotics system – the robotic arm system provides the necessary support to automate inspection routines and thereby improving servitisation of components. The Turtlebot2 – is a research level mobile robotic platforms from Clearpath Robotics Inc, combined with an advanced 5 DoF robotic arm from Trossen Robotics provide the capabilities for mobile robotic manipulation. 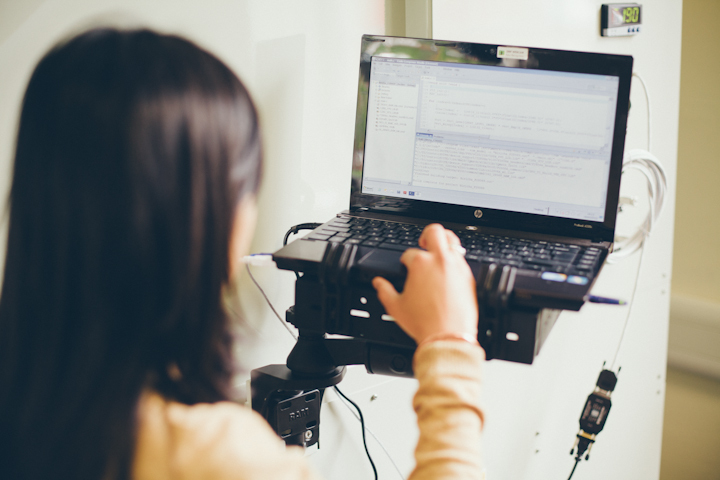 Integrated with the state of the art robotics operating system (ROS) the robotic platforms lie on the cutting edge of robotics research allowing the centre to investigate how mobile collaborative robotics can be used within an industrial setting. EasyHeat 2.4kW induction heating system – capable of heating metallic components through induction. The cooling characteristics of the heated component are monitored using the infrared cameras’ to evaluate the health of the component. Omega BB702VAC blackbody calibrator – capable of providing a temperature references between 32°C and 215°C to help calibrate infrared cameras’ and other thermography experimental work setup. Phased Array system – An Omniscan MX Ultrasonic Flaw detector by Olympus provides powerful inspection for manual and automated NDT inspections. The system comes with a range of probes and software kit capable of carrying out Time-of-Flight Diffraction (TOFD) testing. Eddy Current Inspections system – An Omniscan MX system with a flexible probe by Olympus provides the conventional NDT technique capable of performing both eddy current testing and eddy current array inspection. Acoustic emission – A 6-channel Physical Acoustics PCI-2 system which is capable of detecting and locating damage such as fatigue cracks via stress waves (emissions) produced within the material when subjected to load. Guided ultrasonic wave – A 30-channel Accelent ScanGenie system which performs active interrogation of a structure using lamb waves to detect and locate damage such as fatigue cracks. Fibre optics – A dynamic Fibre Bragg Grating (FBG) interrogation system by Smart Fibres which monitors mechanical strain. It comprises of 2 channels with up to 16 sensors per channel. Intermittent Fault Detection– NCompass by Copernicus Ltd is a state of the art intermittent fault detection and isolation system which determines the root cause of electronic equipment and No Fault Found (NFF) problems including wiring integrity testing & trending, first-time-fix capability etc. Virtual Reality Suite – 3D visualisation capabilities used to study system architecture design for engineering services linking design rules with system design in a 2D and 3D virtual space. Siemens PLM will extensively be used to visualise the manufacturing process and life cycle mock up designs. IT and High End Workstations – Capabilities include Siemens PLM Suite, Matlab & Simulink, Video-conferencing, Touch tables, iPads etc. For more information please contact Dr Pavan Addepalli, Research Fellow - Degradation Assessment.